Bah! Who am I kidding?! It is just a blog. There are these 'must-read' books that keep getting added to my Reading Wish List depending on my mood. Sometimes it is action-packed YA escapism, sometimes it is pure brilliant humor, sometimes it is a stack of poetry picture books, and sometimes it is mind-opening non-fiction. After intense YA action with the Heroes of Olympus series, I was in the mood for non-fiction and devoured the three books that I am writing about here. The style of writing, the facts, and the nature of the topics made them fascinating. 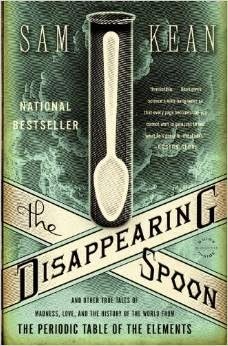 From Peppers, Nutmeg, and Cloves - the spices that gave birth to the Age of Discovery, to Morphine, Nicotine, Caffeine; and Chlorocarbon compounds that made refrigeration an everyday reality for food preservation, the book talks about seventeen molecules that the author feels were pivotal in bringing about changes that led us to where we are today. Engaging style and crisp text makes this an absorbing read. Chemical structure of these compounds are shown diagrammatically, with clear explanation to follow along. Having enjoyed organic chemistry in high school and college days, I found it engaging to compare the structures of closely related molecules. With a cheeky voice and affable sense of humor, the book tells us about the Periodic Table of Elements. Early in the book, the author types out a complex page-long name of a molecule which I sincerely started to read; then, conveniently flipped to the next page thinking it might not make a difference if I read the whole confusing name or not. But, the author catches us skip-reading! With a mild reprimand, he sends us back to the previous page to discern the pattern in naming the long molecule, referring to it as the "anaconda". I was hooked. The title derives from a practical joke that was popular in the early days, when a spoon made of Gallium would be given to an unsuspecting guest at tea; the prankster-chemists would watch with glee when the poor guest's spoon dissolved while stirring the hot tea. Relevance of chemistry to the real world is impossible to ignore. yet, somehow, the curriculum texts ignore this connection and make the study of the subject as insipid and sterile as possible. For the nitpicky experts, there might be some sticky points and outright errors in this book, but as a science-loving semi-layman I found this book well worth the time. If we've ever lost or misplaced our keys or cell phone, we know the frustration. And when we take an inventory of our “miscellaneous/junk” drawer only to notice rubber bands, old batteries, maybe an unnamed CD or DVD, some loose change, ticket stubs, assorted pens that don’t write and half a dozen other things, we are afraid to throw them away as they might be needed the minute they are tossed out. The author, Daniel Levitin, professor of behavioural neuroscience at McGill University, explains that when everything has an allotted place - in the house, and in our memory - there is minimal chance of things ever getting lost. And when things that don’t easily fall into a predefined category and cannot be organized in a coherent manner, we tend to file them under the “miscellaneous/junk” section, both physically and mentally. Now, what happens when we have way more things than slots to organize them in? That’s where we run into issues. The book is organized in three parts. 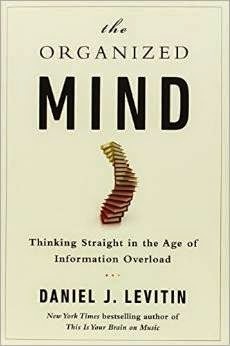 Part One sets up the scenario where we have too much information and too many decisions to make in our current lifestyle, and explains how Attention and Memory work. Part Two is all about organizing - our homes, our social lives, our business, our time, and all the information we need to make the hardest decisions. Part Three gives a glimpse of the future by laying out what to teach our children, and finally the significance of having a “junk drawer” to make our lives manageable. I was particularly interested in Part Three. Whereas in my pre-Internet school days, if I wanted to know anything in particular about prehistoric life on earth or about firewalking, I had to look it up in a book, possibly at the library. Sifting through index catalog and getting the librarian's help, I might narrow down a handful of books and microfiche to look up, with no guarantee that the exact piece of information I am seeking will be in any of those books. But my children, when stumped by questions, unabashedly say, “let me look it up” and they dash to the iPad or iPhone or laptop, whichever is handy, and simply “google it”. Is this form of getting information quickly any better than the delayed gratification of physically poring over shelves of books at the library? And, are the online search results reliable? What happens when they run into contradictory information? How can we help our children develop the ability to screen and weigh the information and recognize patterns in general and organize it efficiently, and apply the scientific methods to delve deeper and gain expertise? ©: Please Ask, Don't Take! Pictures and text in this blog may not be used anywhere without express written permission. Please drop me a note for requests to use my images, text etc., either as a comment here on any of my posts, or via email by clicking the icon below. I've added an Email Me link in my menu bar as well. Thanks! Copyright: the pictures and text in this blog may not be used anywhere without express written permission. Thanks.